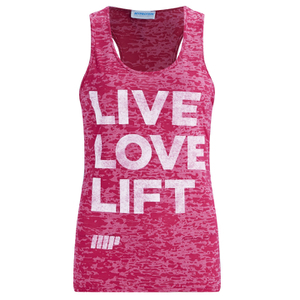 The Myprotein Women’s Performance Vest is a lightweight, fitted tank top made from a sweat wicking polyester fabric. The tailored fit delivers both style and comfort, staying close during even the most strenuous of workouts. Emblazoned with a “Do More Be More” slogan across the front similar to the popular Myprotein Burnout vests, you can now have the same style in a performance fabric and fit. Nice material. The measurements for this top is not correct. the UK8 (US4) is not nearly as long as stated on the sizing chart. It states the length is 27" in length. When I tried on the shirt I noticed it is a little short. It only measures 23" in length. I do prefer longer tops but I still enjoy the writing on the top. All other measurement on the sizing chart are correct, the shirt just runs shorter than stated.